Our hotel’s suites can accommodate 2 up to 4 people. 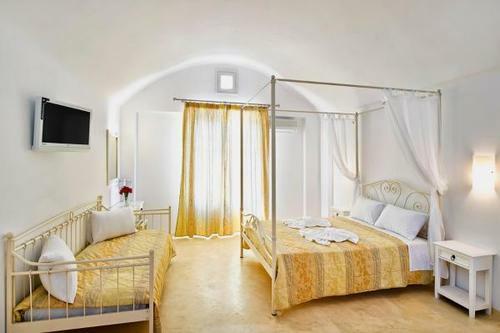 They are spacious rooms that consist of one bedroom with a double iron bed and a seating area with 2 single beds. They are characterized by their furnishing’s traditional island style, adjusted to the modern elegance in a harmonic way. Their decoration is based on vivid colors which create a pleasant and happy atmosphere. They dispose of a bathroom with Jacuzzi. They have a balcony with views over the sea and the sunset. Enjoy the dawning of the new day and see first the sun illuminating the island. Unforgettable experience! The suites are air conditioned and they dispose of a satellite TV, safe box, free Wi-Fi everywhere in the hotel, fridge,bathroom with Jacuzzi and a hair dryer. The superior rooms for 3 people are spacious rooms which offer their guests all kinds of comforts. Their elegant furnishing and their vivid colors create a beautiful and familiar atmosphere. They combine island style with modern elements. They dispose of a double iron bed and a single iron bed. 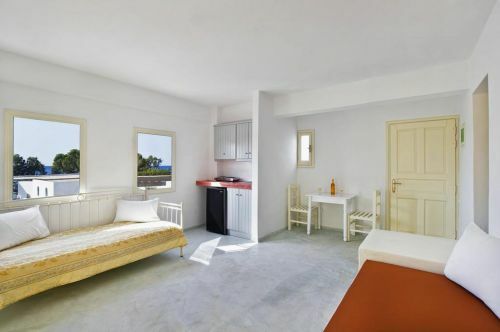 Their particularity is that they have a bathroom with a built-in shower according to the traditional Cycladic pattern. 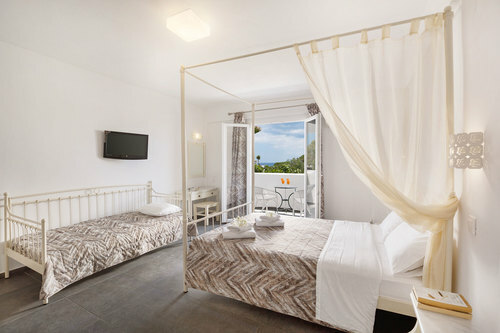 All the superior rooms are air conditioned and they dispose of a satellite TV, a safe box, free Wi-Fi everywhere in the hotel, fridge,bathroom with built-in shower and a hair dryer as well as a private, furnished balcony. 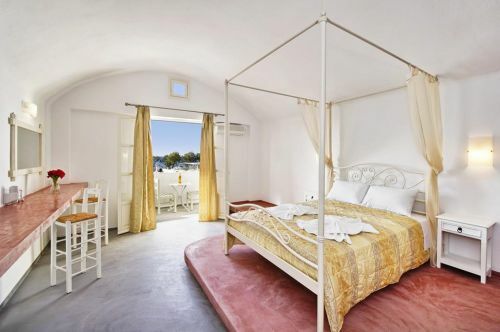 The rooms for 3 people are spacious rooms which offer a comfortable stay to their guests. They are characterized from the traditional island style of their furnishing, adjusted harmonically to the modern elegance. They dispose of a double iron bed and a single iron bed. Their decoration is dominated from vivid colors which create a pleasant and happy atmosphere. They have a private balcony with view over the pool and the hotel’s garden. All the rooms are air conditioned and they dispose of satellite TV, safe box, free WiFi everywhere in the hotel, fridge,bathroom with shower and a hair dryer. The superior rooms for 2 people are spacious rooms which offer a comfortable stay to their guests. Their elegant furnishing and their vivid colors create a warm, idyllic atmosphere. They combine the island style with modern elements. Their particularity is that they have a bath tub into the room and a separate WC. They have a double iron bed. From their balcony which has view over the sea, we propose you to enjoy the sunset. You may also have the chance to enjoy the full moon drinking Santorini’s wine. Unique experience! 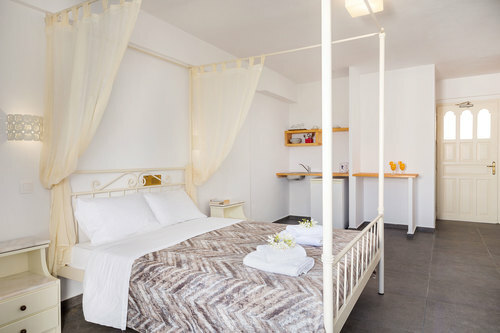 All the superior rooms are air conditioned and they dispose of satellite TV, safe box, free Wi-Fi everywhere in the hotel, fridge, bathroom and a hair dryer. The rooms for 2 people are spacious rooms that offer the guests all the comforts. Their furnishing combines in a harmonic way the traditional style and the modern elegance. They dispose of a double iron bed while their decoration is based on vivid colors which create a pleasant and happy atmosphere. They have a private balcony with views over the pool and the hotel’s garden. All the rooms are air conditioned and they dispose of satellite TV, safe box, free WiFi everywhere in the hotel, fridge bathroom with shower and a hair dryer.